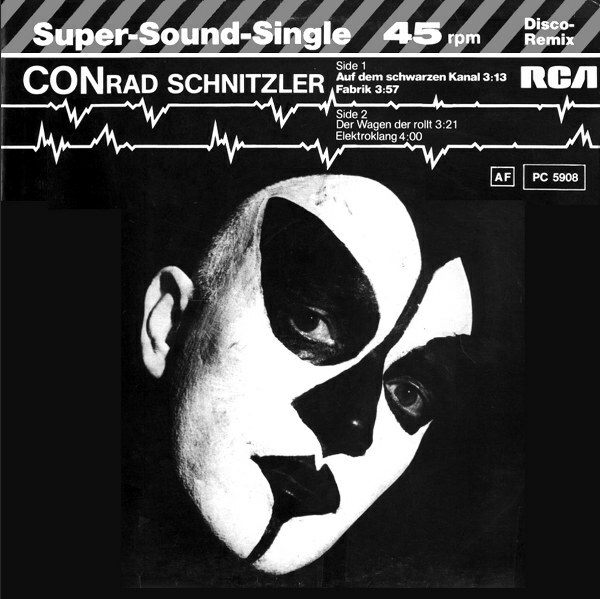 At Left: My Favorite album sleeve ever from Conrad Schnitzler, who died on August 4th from stomach cancer. A true genius, a true giant- and one of my favorite Electronic artists ever. 1) Der Riese Und Seine Frau from "Grun"
2) Klopfzeichen: Part One, Kluster from "Klopfzeichen"
3) Prince Farm's Balance Buddha, De Fabriek from "Labish Intermediaries"
5) Fabrik from "Auf Dem Schwarzen Kanal"
6) Ashes To Ashes, Tangerine Dream from "Electronic Meditation"
8) Gelb 4 & Gelb 5, from "Gelb"
12) Zwei Osterei I, Kluster from "Zwei Osterei"
18) Side B, from "Con"
Thanks for the Con tribute show!